Transwestern reccently announced it has been retained to sell Sand Lake Corners North, a 151,487-square-foot, Class A community shopping center shadow-anchored by Wal-Mart. 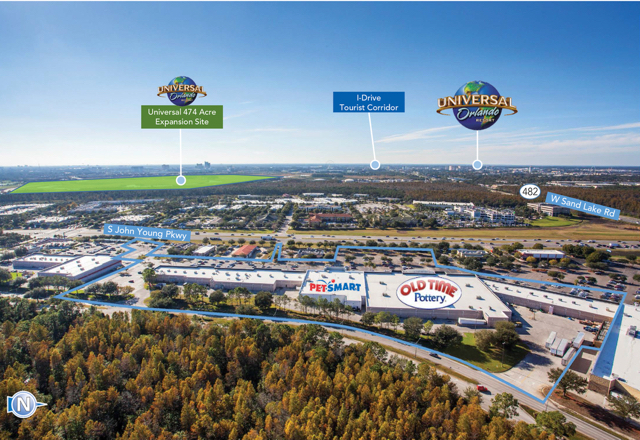 Transwestern Managing Director John Bell is marketing the institutional-quality property at 8115 – 8379 S. John Young Parkway in Orlando, Florida’s bustling Tourist Corridor. Currently 92.6 percent occupied with a majority of long-term leases from long-standing tenants, the property offers the security of established in-place income. The community shopping center is embedded within Orlando’s greatest concentration of Class A office and distribution parks, SouthPark Center, which boasts 2.9 million square feet of office space spanning 176 acres. Average rents for retail space in Orlando’s Tourist Corridor peaked 7.4 percent higher in the last cycle than today’s rents. Built in 1999 and remodeled in 2005, Sand Lake Corners North’s anchors – Old Time Pottery, PetSmart and Dollar Tree – are further enhanced by proximity to best-in-class shadow anchors Wal-Mart Supercenter and Lowe’s Home Improvement Store, as well as 11 shadow outparcels including 7-Eleven, Burger King, Goodyear Tire, Denny’s, Bead Time, McDonald’s, Discount Tire Co., Logan’s Roadhouse, Wendy’s, Dunkin’ Donuts, Five Guys, and Speedway. The property spans over 15 acres on a high-profile, signaled intersection of Sand Lake Road and John Young Parkway, providing a 97,000 daily traffic count and connecting the tourist cluster along International Drive with Universal Parks to the west and the Florida Mall and airport to the east. 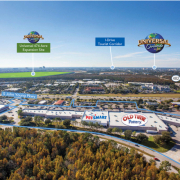 Sand Lake Corners North is located at the doorstep of Universal Studio’s 474-acre expansion site that will inevitably be developed with entertainment and lodging, creating explosive employment drivers and growth to spike values for nearby properties. “The property stands squarely at the gateway to this important site, and can expect value increases beyond its existing successful shopping center economics,” continued Bell. Bell has executed real estate transactions in excess of $3 billion across all asset types, with a primary focus in the Florida and Southeast U.S. markets. He is an expert in trophy and distressed assets and has a diverse roster of institutional, private and special servicer clients. Get the latest industry news and information from CRE-sources delivered right to your email inbox!